Tomato (Solanum lycopersicum L.) is an important vegetable crop and acts as model plant for fruit development studies. Besides that, post-harvest damage is a devastating phenomenon often associated with ripening process in tomato which in turn leads to greater yield loss. Understanding the genetics, molecular and biochemical pathways is the key to overcome the existing situation. In the present study, we have identified a delayed ripening mutant and used in identification of linked marker for delayed fruit ripening. Initially, BML-03 (delayed ripening mutant line) was crossed with BIL-29 (normal ripening inbred line) to produce F2 population. Bulked segregate analysis was carried out using 245 SSR markers. Out of which, five SSRs were found to be polymorphic between parental lines and respective bulks along with a segregating genotype of mapping population. 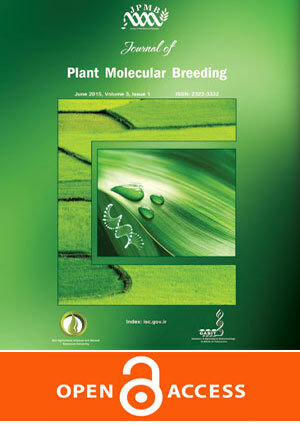 A population of 227 F2 plants was screened with five polymorphic SSR markers and the data were used in linkage analysis. Three SSR markers were found to be co-segregating with the delayed ripening phenotype and resulted in a linkage map which covered the map distance of 3.4 cM. Out of 3 markers TGS0070 was found to be closely linked to the fruit ripening locus and was successfully validated using other ripening specific F2 population BML-28 x BIL-3. Areshchenkova T, Ganal MW (2002) Comparative analysis of polymorphism and chromosomal location of tomato microsatellite markers isolated from different sources. Theor Appl Genet 104:229–235. Barry CS, McQuinn RP, Thompson AJ (2005) Ethylene insensitivity conferred by the Green-ripe and Never-ripe 2 ripening mutants of tomato. Plant Physiol 138:267–275. Bentler PM, Bonnett DG (1980) Significance tests and goodness of fit in the anlaysis of covariance structures. Psychol Bull 88:588–606. Causse M, Duffe P, Gomez MC (2004) A genetic map of candidate genes and QTLs involved in tomato fruit size and composition. J Exp Bot 55:1671–1685. Chapman NH, Bonnet J, Grivet L (2012) High-Resolution Mapping of a Fruit Firmness-Related Quantitative Trait Locus in Tomato Reveals Epistatic Interactions Associated with a Complex Combinatorial Locus. Plant Physiol 159:1644–1657. Doganlar S, Tanksley SD, Mutschler MA (2000) Identification and molecular mapping of loci controlling fruit ripening time in tomato. TAG Theor. Appl. Genet. 100:249–255. Foolad MR (2007) Genome mapping and molecular breeding of tomato. Int J Plant Genomics. Giovannoni, J. (2001) Molecular biology of fruit maturation and ripening. Annual review of plant biology, 52(1), 725-749. Giovannoni J, Yen H, Shelton B (1999) Genetic mapping of ripening and ethylene-related loci in tomato. Theor Appl Genet 98:1005–1013. Giovannoni JJ, Noensie EN, Ruezinsky DM (1995) Molecular genetic analysis of the ripening-inhibitor and non-ripening loci of tomato: A first step in genetic map-based cloning of fruit ripening genes. Mol Gen Genet 248:195–206. Kinkade MP, Foolad MR (2013) Validation and fine mapping of lyc12.1, a QTL for increased tomato fruit lycopene content. Theor Appl Genet 126:2163–2175. Klee HJ, Giovannoni JJ (2011) Genetics and Control of Tomato Fruit Ripening and Quality Attributes. Annu. Rev. Genet. 45:41–59. Liu X, You J, Guo L (2011) Genetic Analysis of Segregation Distortion of SSR Markers in F2 Population of Barley. J Agric Sci 3:172–177. Lorieux M (2012) MapDisto: Fast and efficient computation of genetic linkage maps. Mol Breed 30:1231–1235. Martel C, Vrebalov J, Tafelmeyer P, Giovannoni JJ (2011) The Tomato MADS-Box Transcription Factor RIPENING INHIBITOR Interacts with Promoters Involved in Numerous Ripening Processes in a COLORLESS NONRIPENING-Dependent Manner. PLANT Physiol. 157:1568–1579. Moore S, Vrebalov J, Payton P, Giovannoni J (2002) Use of genomics tools to isolate key ripening genes and analyse fruit maturation in tomato. J Exp Bot 53:2023–2030. Passam HC, Karapanos IC, Bebeli PJ, Savvas D (2007) A review of recent research on tomato nutrition, breeding and post-harvest technology with reference to fruit quality. Eur J Plant Sci Biotechnol 1 (1):1–21. Semel Y, Nissenbaum J, Menda N (2006) Overdominant quantitative trait loci for yield and fitness in tomato. Proc Natl Acad Sci U S A 103:12981–12986. Shirasawa K, Asamizu E, Fukuoka H (2010) An interspecific linkage map of SSR and intronic polymorphism markers in tomato. Theor Appl Genet 121:731–739. Tanksley SD, Ganal MW, Prince JP (1992) High density molecular linkage maps of the tomato and potato genomes. Genetics 132:1141–1160. Van Der Knaap E, Tanksley SD (2001) Identification and characterization of a novel locus controlling early fruit development in tomato. Theor Appl Genet 103:353–358. Zhang LP, Khan A, Niño-Liu D, Foolad MR (2002) A molecular linkage map of tomato displaying chromosomal locations of resistance gene analogs based on a Lycopersicon esculentum x Lycopersicon hirsutum cross. Genome 45:133–46. Zhang M, Yuan B, Leng P (2009) The role of ABA in triggering ethylene biosynthesis and ripening of tomato fruit. J Exp Bot 60:1579–1588.